Hi! 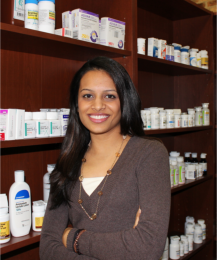 I’m Bhavi Patel and I’m looking forward to providing the highest quality service and value every time you come into my pharmacy. I graduated from the University of Findlay with a Pharm.D in 2010. I have many years of experience working in community pharmacies such as CVS, Walgreens, Kroger and several independent pharmacies. I moved to the South Loop and have loved this neighborhood ever since. I enjoy the access to local south loop restaurants, parks, museums and lakefront that no other neighborhood in the city can offer. Living and working the in south loop is a pleasure and I look forward to meeting you soon. Hi! I’m Kushal Patel and I hope to provide you with the highest level of care and service possible. 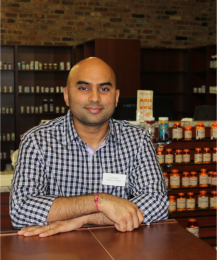 I over 10 years of experience working in community pharmacies such as Schnucks, Kroger, Walgreens and other, local independent pharmacies. I specialize in making custom compounded medications for patients all over Illinois and I am looking forward to working with you and your doctor to customize medications to suit your needs. I moved to the South Loop in 2011 and have loved the neighborhood ever since. I love everything the neighborhood has to offer and I look forward to continuing the trend of making the south loop a great place to live. I look forward to meeting you and please, stop by and introduce yourself soon! I would love to meet you!